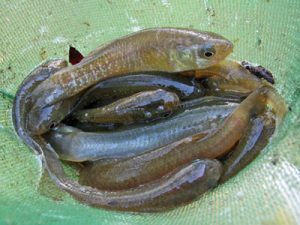 Live bait can be caught in most Virginia waters using equipment such as cast nets, sabiki rigs, seines, dip nets, minnow and fish traps, and umbrella nets. These options allow anglers to catch live baits such as grass shrimp, crabs, squid, silversides, mummichugs, spot, mullet, pinfish, pigfish, eels, and other small fish. A short trip to catch bait can be done the night before, the morning of a trip or just to stock up on bait destined for the freezer. One of the easiest baits to obtain is the mole crab, an odd-looking crustacean found in the surf. Mole crabs can be caught by hand, with shovels, or with specially designed scoops. Mole crabs are used for catching striped bass, kingfish, sheepshead, tautog, and other fish. Cast nets are excellent tools for catching bait. They work well in the surf, along shorelines and from boats. To catch bait effectively, a quality cast net is important. Cheap versions may not open or sink correctly, which allow fish to escape in some situations. Minnow traps are easy to use. These traps consist of 2 bucket shaped sections that snap together. Each half is made of wire and has a funnel shaped entrance. A line secures the trap to a dock or piling. The trap is baited with fish scraps, bread, raw chicken necks or other baits and left overnight. Minnow traps work well for smaller baits such as minnows and grass shrimp. Spot, pinfish, small perch, eels, and other baits can be caught using fish traps. These are special traps which are designed to catch fish more than crabs. Cans of cat food are sometimes pierced enough to leak and used for bait in spot traps. Other baits such as fish scraps can also be used for attracting baitfish to the trap. Always check local regulations before attempting to catch bait with traps. Seines work well but are bulky, expensive and require a large amount of effort. Seines are fine mesh nets with a pole on each end. Fishermen work in pairs, pulling the net across the bottom and up onto a shallow shoreline. Seines will catch practically everything in their path, including small fish, crabs, shrimp, and other baits. Dip nets are sometimes useful, especially at night under lights. An area can be dipped blindly, or sprinkled with cat food and swept with the dip net after a few moments. structure. Sabiki rigs can be used to catch spot, perch, herring, and even silversides. Finding live bait for offshore fishing can be difficult. There are a few possibilities, but catching bait in the ocean may not be reliable. One option is to stop on an inshore wreck or reef and jig small lures for small fish such as bluefish or jacks. Buoys or floating debris may also hold live baits. Often small jacks or other pelagic fish will congregate under an object and strike a small flashy lure or a light leader and baited hook. In some cases a bottom rig will catch small fish, depending on the location. Once night falls, options get better as squid, tinker mackerel, or other baitfish may appear. Squid will take a baited line, or special jig, while tinker mackerel will eagerly attack the essential Sabiki rig which should be standard equipment on summer overnight trips. Learning to brine baits can greatly enhance your stock of fishing bait. Brining will preserve and toughen bait, making it suitable for freezing and more useful after thawing. Step 1. Prepare baits by rinsing in sea water. Cut larger baits such as fish bellies or squid into strips. Step 2. Add baits and coarse kosher salt to a ziploc bag and shake vigorously. Add enough salt to thoroughly coat all the baits. Step 3. Purge excess air from the bag and freeze. Most baits will remain somewhat flexible due to the salt, even when frozen. Well brined baits often last up to a year.